We write with grateful but heavy hearts to share the news of Peter's passing this morning, May 18th, at 7:40 a.m. The loss we feel is profound, and yet we rejoice in faith that he is even now entering into the light of God's presence. He went in peace, surrounded by our prayers. For those of you who are in the area and would like to come, a memorial service in honor of Peter's life will be held next Friday, May 24 at 2:30pm at Calvin Presbyterian Church in Corvallis. The reception following the service will be held at our home. These past few weeks have been intense and sad, as we've cared for Peter in his steady decline. For those of you who are counting, Peter's death comes just a few days short of the 2-4 month prognosis his doctors gave us in March. 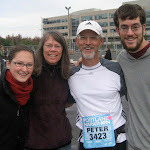 If Peter were here to write this post, he'd certainly have plenty of conjectures about how and why his cancer went the way it did towards the end and what it all means medically. The truth is that we will never know - we simply rest in thanksgiving for Christ's presence with us, the Great Physician who knows the inner workings of our bodies and ordains the days of our life, and the moment of our death. Cancer did not have the final word in Peter's story. His journey has only begun now that he has passed into the "life that is truly life" (1 Tim. 6:19), where we trust he will live with God forever in his resurrected body. We want to thank you all for your prayers, kind thoughts, phone calls, blog comments, messages, and words of encouragement during this time - our whole family has felt your care so deeply and truly sense our unity in Christ's love. We're especially thankful for the season of Pentecost that is now upon us, and trust that the Holy Spirit will come to our hearts to illuminate and console, as Jesus promised. We do not mourn as those who have no hope. Peter L. Ogle, asleep in the Lord. Wish I could have met you in person but I know I will meet you again one day. Your words and thoughts have been inspirational to me as I endure my own melanoma battle and they will continue to provide me hope and understanding long after your passing. Thanks to you and your family for taking the time to maintain this blog. It's been more helpful than you will ever know. RIP Peter. Grateful to have counted you as a friend. I plan to come pay respects to Ellen and family next Friday. My prayers are with you all. On behalf of your many friends in the Bay Area, and especially those with ties to First Pres Berkeley, we remain in prayer for you and your family. Peter shared his heart with all and especially in the past couple of years, he was a deep reflection of our Lord Jesus Christ to me. Will see you all Friday. You taught us all how to finish this earthly race well and I personally look forward to that day in the future when we will be able to continue our conversations. Perhaps my resurrected body will allow me to be a runner too! Death leaves us with this juxtaposition of deep sorrow as we grieve the loss of a son, husband, father, brother and good friend and ecstatic joy as we each contemplate our own mortality and our expectation in the final resurrection. Thank you my friend for the many years of shared life. Goodbye until we meet again in glory! Thank you for posting this sad news. Although Peter himself would probably not have called it "sad news"-- he truly believed in and looked forward to everlasting life in God. Peter was an extremely grounded man who had a rare ability to fight vigorously and intelligently for continued good heath while simultaneously maintaining his inner peace and acceptance of God's will. He was quite a guy whose several years of post-diagnosis activity and optimism were very inspirational to the rest of us. Thank you, Peter and Peter's family, for sharing the life, the love, and the insights of such a wonderful man. The peace and assurance with which Peter left us is testimony of Christ's tender care, and of his family and friends' love and dedication. Thank all of you for showing the rest of us how to finish well. I feel such an emptiness today even though I haven't seen you all in so long. Peter taught me so much when we worked together and he is still teaching us now. My deepest sympathies to all of you. Thank you for your beautiful writings and for sharing his ending with us. I never met Peter in person, only through email. We had the opportunity to rent the Sea Shanty for a weekend are really enjoyed it. Hope and I are saddened to hear of his passing. I am sure he is smiling down from Heaven seeing how many people he touched in his life. I only met Peter once, at a melanoma symposium in Seattle last May. He provided much inspiration for me over the past year through email correspondence and his blog entries. Our outdoor lifestyles and original melanoma diagnoses bore much in common. Peter was generous with his advice and it was always a pleasure to read his thoughtful and eloquently postings. I will miss him as I continue my own journey with melanoma. My sincer condolences to Peter's family. He felt very grateful for his wonderful wife and children. I stumbled upon this blog recently and have been reading in from the beginning, every so often jumping ahead to see how things were going in "real time." This blog has been such a blessing to me. Thanks to all of you for sharing this journey. Peter has taught me so much and given me so much to think about. I'll miss him as much as someone I might have actually known. My deepest condolences to his family and friends. He was a very special person. It is good to know you are running with Abby on Heaven's beach. It has been an honor and a pleasure to know you for more than 40 years - as a shy kid in middle school, an aspiring journalist, as a friend, and as the years went by, a loving father, family man, outdoorsman, environmentalist, gardener, philanthropist, teacher, mentor, inspired writer, and man of God. You are a remarkable man who will live on in the hearts and minds of those of us fortunate to have crossed paths with you in this earthly realm. I have enjoyed your page turner life novel since the beginning, and am sad but peaceful as I read and reread these last pages. We'll miss you, Peter, but I can only imagine the wonders you are experiencing as you begin to write the sequel. Godspeed, my friend. True inner character shows itself when life is the hardest. Peter’s Christ-like character stood tall and strong and will live forever as a model of how to live and how to die. I will miss wonderful conversations and Peter’s never-ending creative ideas. I have been so blessed by the way Peter lived and died to the glory of God. He leaves an incredible legacy to all of us who are his brothers and sisters in the Lord. My favorite post is the Nightlight post from October 2010. I would be so honored if you would allow me to share this with the readers of my blog. I'd love for them to benefit from Peter's perspective and example. 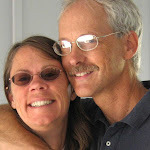 My web address is www.divinedesigndiscipleship.com in case you'd feel more comfortable seeing where the post would be shared. I didn't want to do so without your permission. Either way, my prayers are with you all for God's strength and comfort. I have been blessed by all the history of this blog,... thanks for leaving it up. He is still planting seeds and harvesting fruit. I just read Peter's blog, The Ogler, where he wrote about Gandalf stated "You Will Not Pass". I found it so helpful for me and for a friend of mine. Know that despite his passing his words and stories are still touching lives. I lit a candle for Peter on the anniversary of his death - in memory of his life and friendship. I lit a candle for you, dear family, for the promises life unfolding for each of you. I left Oregon State University for nearly two years now and you have always been one of the professors that I remember most. I was just looking up for your email address, hoping to find out about you and your battle with cancer but yet left in shocked to receive this news. I am sorry, Peter, for being so late, as I was always be when I was in your class. I am sad that you are now not with us for passing out pop quiz and candy bars for who scores the highest, but I am sure you are looking down to us from the eternal heaven. Thank you Peter for being such a great teacher, who really cares and always encourages us to go the path we choose. You will live forever Peter, in our hearts, our minds and our thoughts. My deepest condolences to the Ogle's family.